Gregarios III was our host in Lebanon and Syria earlier this year. He has been an outstanding example of Christian leadership throughout the current crisis. 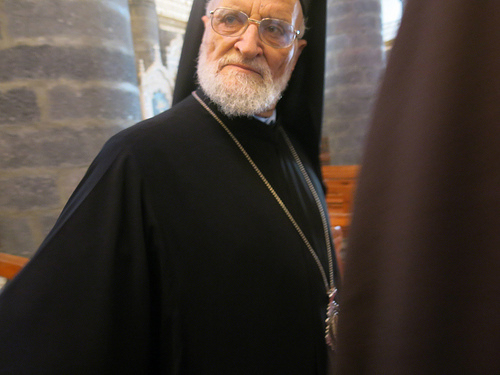 Rather than hide out in his palace in the (relative) safety of Beirut, the Melkite Patriarch has stood alongside the people of Syria in their suffering and has been a tower of strength to Christians across the country. Bombs, kidnapping and financial extortion are among the problems facing Syria’s Christians, the leader of the country’s Catholics told a meeting in Westminster Cathedral Hall. Christians have been targeted because they are seen as “a weak element” and a source of ransom, according to the head of the Melkite Church. Recalling events at Maaloula last month, where jihadists tried to force Christians to convert to Islam, the patriarch reported that a number of villagers were still missing – and all the residents had fled. According to the patriarch 450,000 Christians have left Syria or are internally displaced, including all of his father’s family. Patriarch Gregorios described how in some places Islamist extremists were making life difficult for civilians. He said: “Yabroud is controlled not only by opposition troops but also by some jihadists – not only by the opposition, the opposition is OK, but jihadists are something else. “They have to pay their share as Christians, monthly since the beginning of 2012, $35,000 a month – the share of the Muslim is also maybe more. “But now in spite of paying this monthly amount, on the 27th September and now on the 16th October, the old church of Yabroud, of Constantine and Helena, was shelled by bombs – it was a church before Christianity, it was a temple of Jupiter and converted, an old beautiful church – they put bombs in the church and they discovered two bombs but they dismantled them.” One was planted in the confessional. He stressed that many ordinary Muslims had suffered as well as Christians, and described the country’s history of religious harmony between the faiths – according to the patriarch most jihadists came from outside Syria to join the fighting. Also speaking were Sister Hanan of the Good Shepherd Sisters, who described the congregation’s work with refugees in Lebanon, and John Pontifex, who talked on ACN’s new report about the oppression of Christians, Persecuted and Forgotten? Highlighting the situation in the Middle East and Nigeria, Pontifex paid tribute to the courage and determination of Christians to witness to their Faith despite the hardships and persecution which they have endured. Sister Hanan described help being given to “women and children who have been wounded by life’s circumstance” at the medical centre they run in Beirut. This entry was posted in syrian civil war, syrian rebels and tagged Denning Isles, Father Dave, Lebanon, Melkite Patriarch, OK, Patriarch Gregory III Laham, Sister Hanan, syria, syria now, Syrian Patriarch. Bookmark the permalink. 2 Responses to Syrian Patriarch says that Christians are being targeted!